OUT OF THE WOODS. 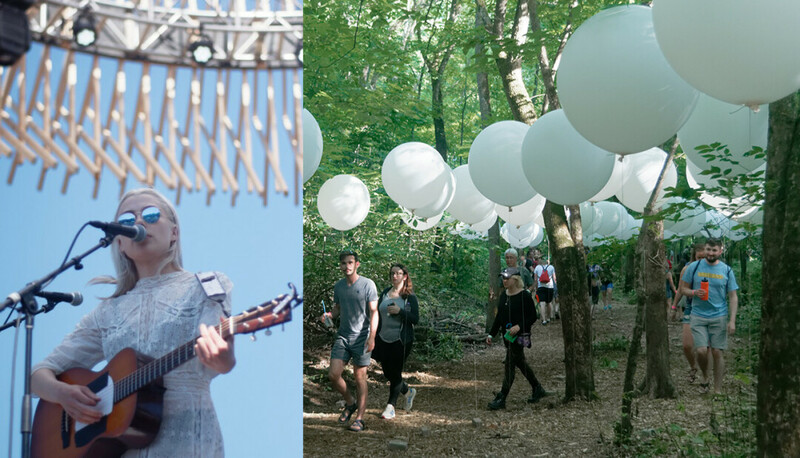 Left: Phoebe Bridgers performs at the 2018 Eaux Claires Music & Arts Festival. Right: Attendees check out art installations. Organizers are set to bring the next Eaux Claires fest right into downtown Eau Claire. 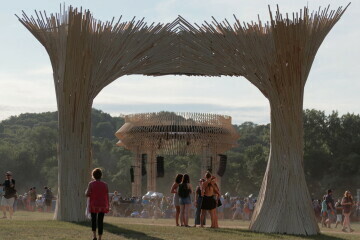 In recent weeks the founders of the Eaux Claires Music and Arts Festival have met in Eau Claire and New York City to plan the next phase of the internationally attended event, which has been curated by Bon Iver’s Justin Vernon and Aaron Dessner of The National, along with creative director Michael Brown. Held over the last four years at Foster Farms just outside of Eau Claire, the two-day festival has gone a long way toward putting our small city on the world’s cultural map with unique collaborative performances, ambitious art installations, and thoughtful integration of its wooded surroundings – earning press and recognition around the globe. Usually by this time of the year, dates would have been set for next year's event and early ticket offerings would have been up for grabs, so the delay has caused speculation on what the future may hold. Well, the answers are now coming into focus. According to Vernon, Dessner, Brown and others involved with the festival, 2019 will serve like something of a “gap year” – a planning and reset year, really. Early discussions have begun with the City of Eau Claire on an entirely new iteration of the event, one that would relaunch in the summer of 2020 right downtown. This new incarnation would utilize new and existing downtown spaces, such as the Pablo Center at the Confluence, Haymarket Plaza, Phoenix Park, private venues, and some of the community’s other nooks and crannies. Scroll down for a statement from the organizers. Moving the event into the heart of the city is an effort to create something with longevity and creative purpose. It’s to plant deeper roots in the community, increase the impact on the local economy, and make the festival more accessible to the public overall. This new model would likely make passes for the festival considerably more affordable, while adding more á la carte-style options (adding on specific shows in some of the larger venues), allowing attendees to craft their own experience. While a move downtown may seem unusual when most of our large-scale local music festivals take place in nearby farm fields, a downtown-based event was actually founder Justin Vernon’s original concept for the festival before it launched on the Country Jam grounds in 2015. Now, four years later, with new venues to work with downtown – such as those inside and around the Pablo Center – that concept is actually possible. In fact, on some level it’s been happening through the community-based “Prex Claires” aspect of the event – where multiple venues have hosted gigs the Thursday night before the festival over the last two years. A move to downtown would be a return to the original inspiration, getting closer to the organizers’ overarching mission of fostering a creative community, pushing for challenging programming, and finding growth through those aims. Thankfully, the coming gap year won’t be devoid of activity from the Eaux Claires crew. Organizers will host a week-long residence program in the fall to help design and plan the downtown version of the festival. The week will end with a presentation of the plans and a day of music in the Pablo Center and around downtown. Throughout the year, an Eaux Claires-based music series will be presented at the Pablo as well. The festival is also working to hire a full-time director and additional full-time staff that can focus on the event year round. 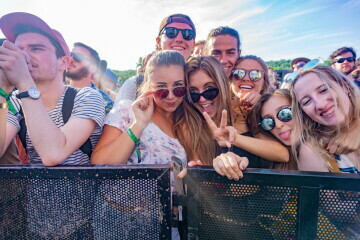 Notably since last year’s festival, Pablo Properties – an organization quickly becoming a household name in Eau Claire – took on partial ownership of Eaux Claires, which has helped allow some flexibility and creativity in the model for the event moving forward. As the lead donor to the Pablo Center (thus the name), Pablo Properties is also the creator of the Lismore Hotel and a partner in the Oxbow Hotel, among other projects. In November they were selected to work with the City of Eau Claire on redevelopment of a block-and-a-half of prime downtown space with a community-focused shipping container park, as well as office and retail space and a new Eau Claire Children’s Museum. Much of that project is scheduled to open in 2020, perhaps some in time for a new Eaux Claires event. In the last four years we have grown together as patrons and organizers; these experiences are perfectly focused within our own collected memories, and feel something like going through four years of high school - the growth, the mistakes, the energy, but most of all the searing, stumbling beauty of becoming one’s self. After our Senior year, we find ourselves wanting to move out, change things, and take stock of who we've become. In order to manage this transition, we are going to take a year off. While it will be hard for us to break the chain of momentum and the positive impact the festival has had on our community, we have fresh, clear ideas of how to make it even better. But we aren’t just changing locations, we're bolstering our philosophies. We want to celebrate EVEN MORE about this REAL TOWN we call home by extolling and imagining things we haven't seen or experienced to date.